Let me start by saying I’m reviewing a product provided by Media Masters Publicity. The review, however, is not influenced by them in any way and is totally my own. Thunder Bay Press has published a book of dot-to-dots for adults. You remember dot-to-dots, right? You start at one and trace from number to number for a big reveal. Where’s Kitty? 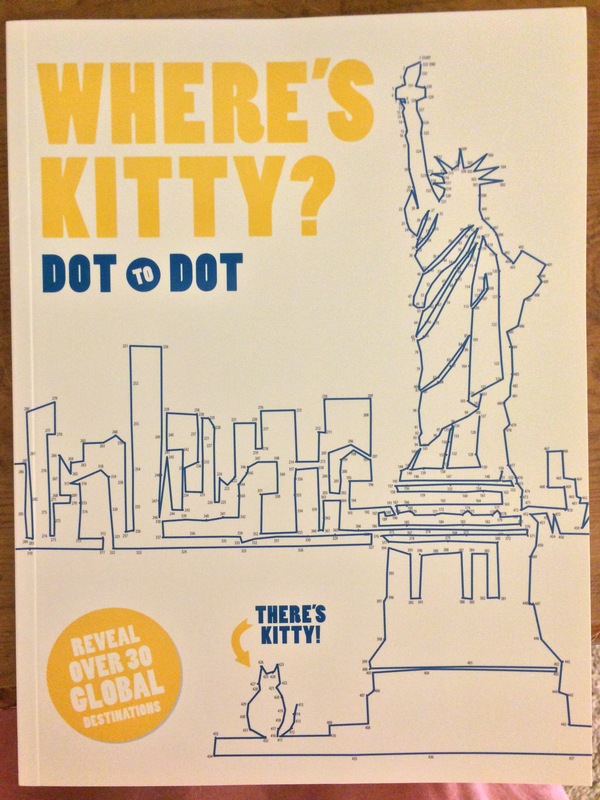 dot-to-dot is designed to reveal over 30 global locations visited by a cat. I was excited to give it a try. So what did I think? I gave it a try; I didn’t care for it. While the idea sounded like fun, the reality for me was I found myself squinting to see the numbers, even with my glasses on. I really needed a magnifying glass, and who wants to do dot-to-dot with a magnifier? Bottom line: While this might be enjoyable for a younger person, it’s not for anyone with any issue with limited vision. I think there is a season for follow the dots. Thanks for your honest review! When I was a kid I used to LOVE “dot-to-dot”…………I wear glasses for reading and I find myself getting aggravated with People Magazine with some of their teeny-tiny type…….just looking at what you posted I think it would drive me crazy! Yeah I loved dot-to-dot too, so I was very disappointed that it turned out to not be enjoyable. Grumpy! I’ve got a magnifying glass but being one-handed……just no! Pass! I love the long complicated dot-to-dots but can’t see them either. I’ve found some mid-level books that are not for little kids but not this small either. I am into coloring books. The library has one program a month with a theme. It is a lot of fun. Dot to dot might be interesting once in a while. well im a bit of a big kid really. love these things. coloruing, dot to dot. in the local paper at christmas and new year they had dot to dots for adults. the numbers went up to between 80 and 100.. enjoyed doing that. i like a word search too.